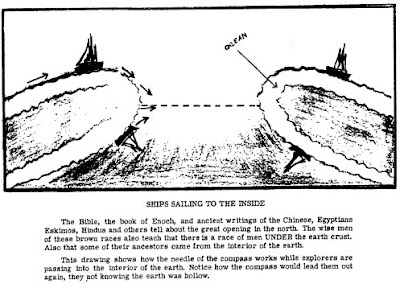 Most have difficulty visualizing how the mechanics of a hollow earth operate. Throw into the mix the idea of a hole at each pole and people really start to get confused. The best way to clear up the confusion is to realize that the earth is a hollow shell much like those eggs you poke holes in at each end and blow the yolk out of. The real clincher, however, is that gravity is centered in the Earth's crust not at its core! ... So, instead of being a point-source, the center of gravity is actually spread out at the center of the crust. The image above helps to illustrate this point. 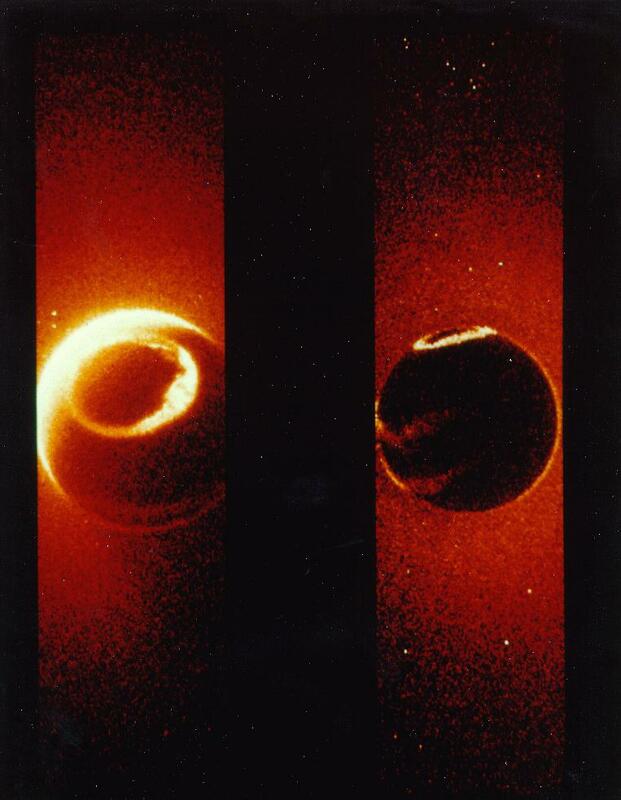 As someone sails around the lip of the opening at the pole, you are never aware that you have just entered the inner earth opening other than a brazen solar "mirage" which is actually the inner sun. As you sail around the lip, gravity is constantly pulling towards the center of the crust so that you never notice a change in gravitational attraction. Perhaps this is why early explorers who did not have GPS made maps with a continent at the northern extremities as they did not realize that they had actually made their way to the inside of the Earth! Advocates of mainstream science use Gaussian mathematics to argue that in a hollow earth model, all gravitational forces cancel each other out. If the Earth is indeed hollow, then gravity is a slightly more complicated (or simple) phenomenon than can be explained with Gaussian physics and the current scientific theory of gravity is in need of an overhaul. The following three sentences are the shortest data-based TOE…seriously. Very seriously. - Self-replication is the ultimate mode of natural selection is the essence and drive and purpose of the universe. Period. - Earth’s RNA nucleotides life is just one of the myriad modes of self-replication. - Everything in the universe derives from mass-energy duality, from the universe cycle between its two poles all-mass/all-energy. The universe is a (circa 20 hillion yrs?) cyclic affair between all-mass and all-energy poles. NATURAL SELECTION of a mass format mandates energy intake because since the big-bang the resolved mass is reconverting at a constant rate from inert mass to energy, to moving mass. The mass that reconverts to energy SELF-REPLICATES to mass, in black holes, for the eventual re-singularity. The energy-to-mass SELF-REPLICATION process is GRAVITY. All this is enabled and goes on and mandated by/due to the small size and shape and inter-attraction of the gravitons that enable zero distance between them to re-form singularity. Set this aside & then open up G.E.6 (or 7). Then go to the South Pole. Activate color inversion, & then look at this area with ANY color camera (NOT webcam) for, “AWESOME 3D, of the Lost Continent Of Lemuria”?!! I discovered this about a year ago in a dream, & forgot about it, until a year later, did I find it again after purchasing an LG840G smartphone & checking out the camera on G.E.6 Works great on 2 megs or more! In this area is also a HUGE Green Bird (Geoglyph? ), with a wingspan of over 500 miles wide! This is sitting atop a chasm, that dips into the earth more than 300 miles deep. And the opening, at the bottom? It’s nearly 10 miles wide. I would like to ask a question regarding the hollow earth entrances located at the poles. And if pole shifts/flips are true. Wouldn't that mean at times the entrance to our hollow earth would be in a much more tropical climate allowing people to come and go much easier? A source of gravity that originates in the crustal sheet is well thought out and postulated by Wallace Thornhill, under the umbrella of Electric Universe research. Gravity is an effect of the way that atoms (being slightly dipolar in nature due to spatial separation of the electron and proton) arrange themselves on large scales. Google for Wallace Thornhill, electric universe, electric/magnetic theory of gravity, and while you're at it you may be very intrigued by the myriad of primers that have been put out by Ben Davidson on his suspicious0bservers website.